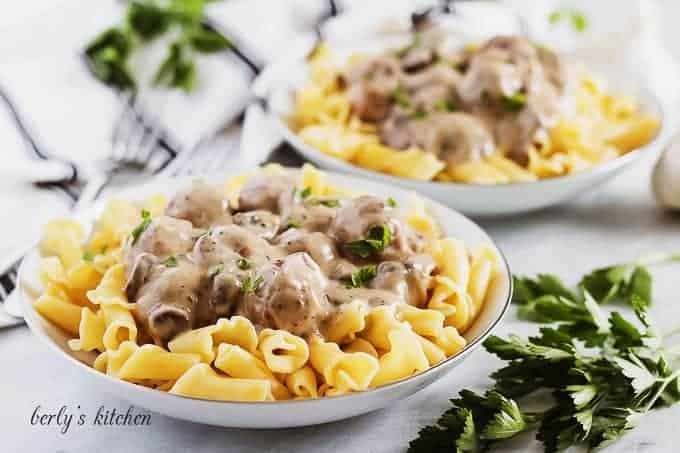 Our Instant Pot Swedish meatballs recipe is a mouth watering combination of beef stroganoff and traditional Swedish meatballs. It’s a match made in heaven! Man oh man, that title is quite the mouthful, huh? Well, you know how it is, we have to play nice with the search engines and social media. With that being said, it’s pretty accurate and I feel the description fits, as well. 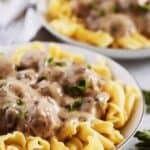 Honestly, these Swedish meatballs with mushrooms are probably one of my top ten (10) favorite pressure cooker meals. It’s simple, yet savory and delicious! I’ve been eating them for a few days now and still haven’t gotten tired of the leftovers. That’s saying something. The recipe is perfect for weeknights as it takes less than an hour from start to finish. As always, I have provided some tips below and if you have any questions, feel free to ask. Kim and I are very approachable 🙂 How about we get started? Alright, to start, grab and prep your ingredients. You know the drill, measure everything out, dice and mince your mushrooms and garlic, etc. After that, turn on your pressure cooker and set it to saute. Toss in the oil, onions, mushrooms, garlic powder, onion powder, salt, and pepper. Let everything cook for a few minutes before adding the minced garlic. Once the garlic has sauteed for about thirty (30) seconds, pour in the broth and scrape the bottom of the liner. At this point, you can place the meatballs into the Instant Pot. Try to arrange them into a single layer like the photo below. Seal the valve and close the lid on your cooker. Adjust the machine to High or Manual pressure for five (5) minutes. When the timer goes off, you need to allow for a ten (10) minute natural release. If you haven’t made the cornstarch slurry, go ahead and do so now. Mix the cold water with the cornstarch to make a milky slurry. Release the valve to let the rest of the pressure out and remove the lid. Use a spoon to take out all the meatballs and then slowly whisk in your sour cream, mustard, and Worcestershire. Afterward, stir in the cornstarch slurry and turn the pressure cooker back on to the saute function. 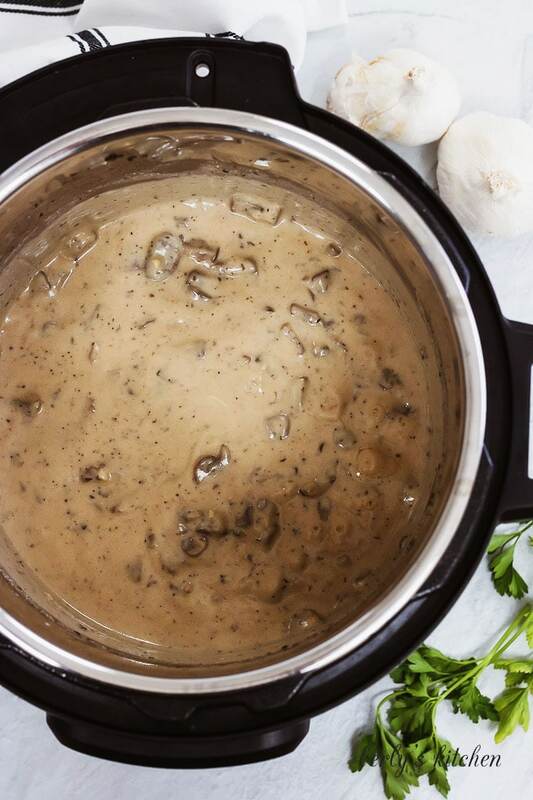 As it heats, the gravy should thicken. When it reaches a thickness you like, turn it off and put the meatballs back into the gravy. 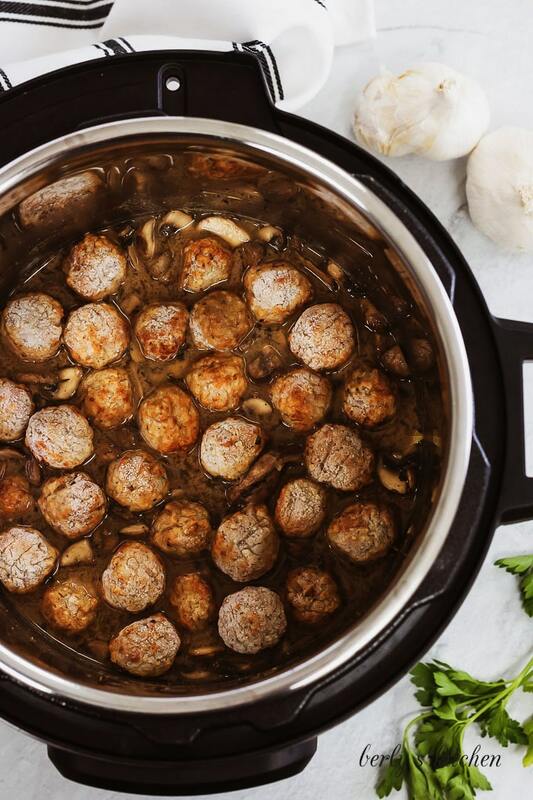 That’s it, your Instant Pot Swedish meatballs with mushrooms are done. Feel free to serve them immediately over a bed of noodles or mashed taters. 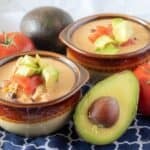 Kim and I hope you enjoy this offering from Berly’s Kitchen, LLC. Okay, so the meatballs we used aren’t really Swedish meatballs. Real ones, have breadcrumbs and seasonings like allspice and nutmeg. 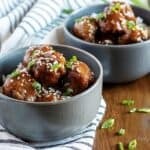 However, due to the sweetness and other ingredients used in processing, frozen meatballs mimic the flavor well enough to pull it off. Who knew, right? To add even more flavor to the dish, I recommend adding one-fourth (1/4) of a cup of red wine to the cooker just before you add the meatballs. Doing so, will infuse the Swedish meatballs with a fruity richness that you won’t get when using beef broth by itself. For the best gravy, set your sour cream out a little early and don’t add it until after the meatballs have been removed. You want to give the liquid a little time to cool before you dump in the cold dairy. 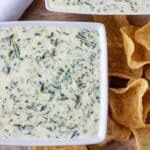 Otherwise, your sour cream will break (separate). 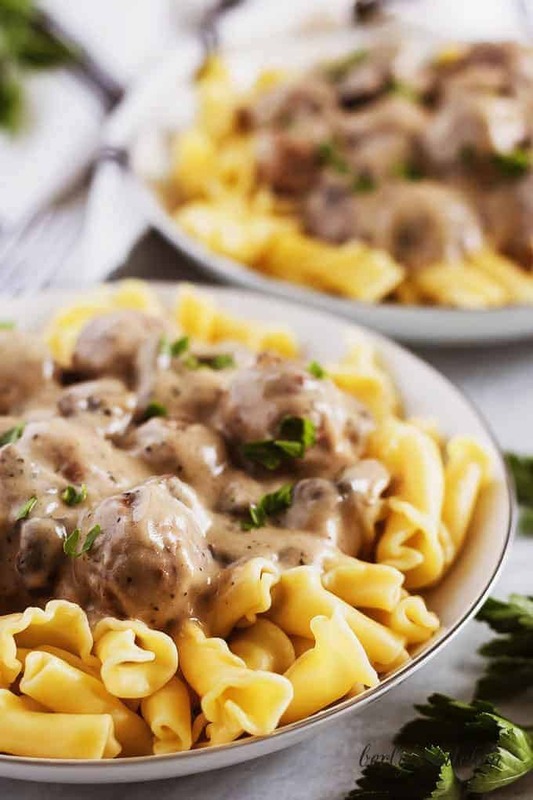 If you enjoyed our Instant Pot Swedish meatballs with mushrooms recipe, please leave us a comment and rate the recipe card. You can also find us on Facebook, Pinterest, Twitter, and Instagram by searching for Berly’s Kitchen! Pour in the beef broth to de-glaze the liner, then turn off the Instant Pot. Add the meatballs, ensuring that they are in a single layer. Close the lid, and use the manual/high pressure button to adjust the cook time to 5 minutes (according to Instant Pot website). Meanwhile, make the cornstarch slurry by mixing the cornstarch with cold water. This is also a good time to prepare the noodles or mashed potatoes. After the time is up, allow a 10 minute natural release before opening the valve to release any remaining pressure. 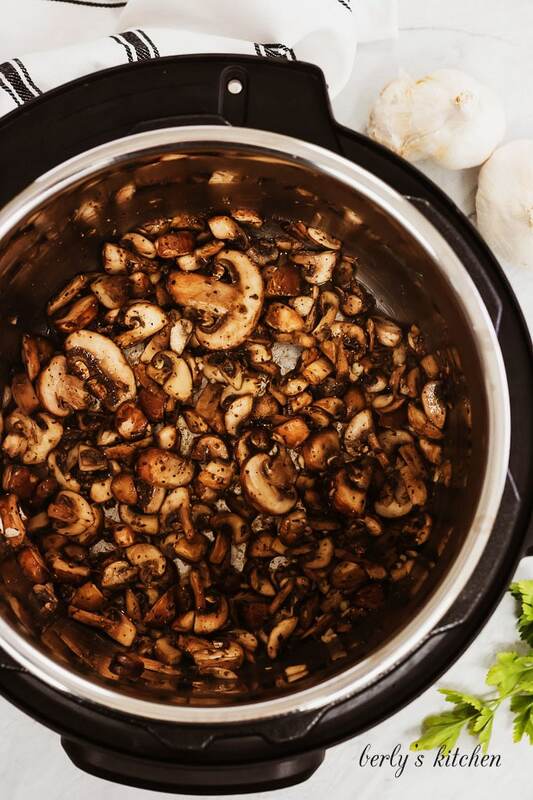 Remove the lid, and turn off the Instant Pot. Use a slotted spoon to remove the meatballs, then carefully add the sour cream, Dijon mustard and Worcestershire sauce. Whisk to combine. Serve immediately over noodles or mashed potatoes. Garnish with fresh parsley. Store any leftovers in the refrigerator for 2-3 days in an airtight container. 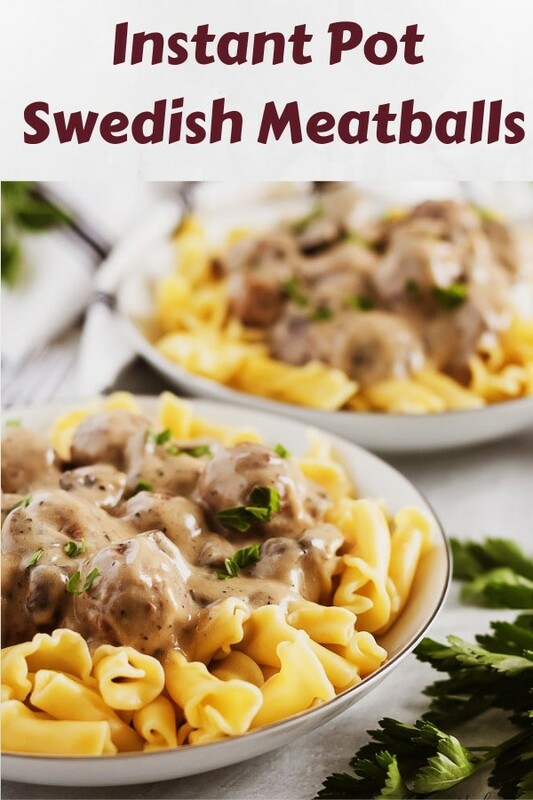 The calories listed are an approximation based on the ingredients and a serving size of one (1) cup of Swedish meatballs. Furthermore, the calorie count does NOT include the pasta noodles or parsley seen in the photographs. Actual calories will vary. The meatballs can be stored in your fridge in a sealed container for up to three (3) days.